Will Apple's Rumored $800 Notebook Be a Netbook? Only Apple personnel and a few others really know what Apple will unveil at Tuesday's town hall special event at Cupertino with the "focus on notebooks". The hottest talking points are speculation about an $800 entry-level MacBook, a new revolutionary manufacturing process using lasers and water-jets to fabricate notebook cases from solid blocs of aluminum, new 16:9 aspect ratio display screens, perhaps Blu-ray optical drives. A price cut to $800 would amount to $300 off the current entry-level MacBook, which would be huge for a product in the same market slot with the same or better level of power and features as the outgoing current MacBook. I guess it could happen. Given the present firestorm engulfing the world economy, desperate times could equal desperate measures. However, I'm more inclined to think that an $800 Mac notebook might a new product, Apple's take on the netbook motif that has proved so wildly successful on the Windows/Linux PC side pioneered by Asustek (a.k.a. 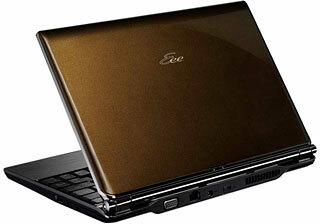 ASUS) with its Eee PC machine, which has been followed by entries in the category from most of the major players. IMHO, Apple needs to have an entry in the netbook category if it wants to keep its laptop momentum going, especially now with the economy in the dumpster and money for discretionary purchases like computers tightening sharply. A week or two ago, it was reported that the only non-netbooks on Amazon's list of top 20 selling computers were MacBooks, leading some to infer an indication that Apple doesn't need to concern itself about the netbook phenomenon and would risk cannibalizing its own sales should it release a netbook. Apple certainly dominates notebook sales at Amazon, but you can't extrapolate from that that people shopping for netbooks are considering the MacBook as an option - only that MacBook sales are doing well against other notebooks. Netbook shoppers are, one can assume, mainly shopping on price, but also looking for lightweight, compact computers with a small physical footprint, a category which Apple vacated when the 12" PowerBook was discontinued in May 2006 - and so far has left vacant. The expensive, feature-compromised, and connectivity-challenged MacBook Air does not remotely fill the gap. Consequently, netbooks are a marketing phenomenon Apple can't afford to ignore, with Amazon's best-selling laptops list dominated by $400 to $600 devices (the MacBook being the sole exception): 3 from Asustek, 4 from Acer, 1 from HP, and 1 from MSI this morning (the 2.4 GHz white MacBook at #8 completes the top 10). Dell and HP have also climbed aboard the netbook train, and entering what we could euphemistically call a protracted period of "economic uncertainty," a continued healthy market for low-priced laptops seems one of the more certain outlooks. 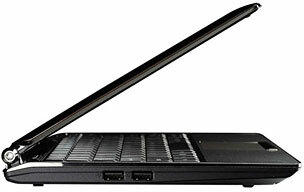 Many netbooks sell for less than $500 (15 of Amazon's top 16, the MacBook being the only exception) with 1 GB of RAM, a 16-20 GB solid state drive or a 160 GB hard drive, WiFi, and a built-in webcam. ThinkPanmure analyst Vijay Rakesh recently weighed in on the topic, trimming estimates on both Apple and Intel with an eye to an anticipated slowdown in the notebook market and increasing competition form the netbook sector. "We believe the netbook market is starting to make inroads into the core notebook market as a more price-conscious consumer opts for the cheaper alternative," Rakesh wrote in an Intel note, also noting that that checks with retailers find netbook sales "swamping core notebook sales . . . with netbooks ramping up while core notebooks are slowing down and potentially slowing down further." Apple needs to cover this vulnerability, if not in tomorrow's announcement, at least by Macworld Expo in January, if it wants to maintain its laptop momentum (at least proportionately) in what will almost certainly be a shrinking personal computer market over the next year or two. The competition is already upping the ante. 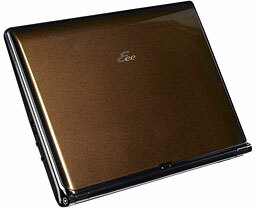 Last week Asustek launched an upmarket version of the Eee PC with its stylish and very attractive S101 model, available in three fashion colors - brown, champagne, and graphite - and highlighted with details like "premium Infusion finishes" and crystal-adorned hinges in a package weighing just 1 kg (2.4 lb.) and 18-25 cm (0.7-1.0") thick - not quite as slim as the MacBook Air, but in the same ballpark. 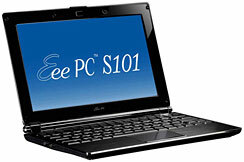 Asus touts the S101 as the "pinnacle of netbook computing." 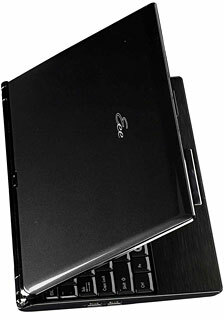 And while it comes at a higher price - $699 - than the regular Eee PC, it's lighter, nearly as thin, and cheaper than a MacBook Air. In my opinion, it looks nicer and has a much more practical and real-world useful specification. The S101 trounces the Air in terms of most aspects and features. It supporting not only WiFi 802.11n and Bluetooth 2.0 connectivity, but also including a VGA port (D-sub 15-pin for external monitor), 3 USB 2.0 ports (to the MacBook Air's overworked single USB port), a real RJ-45 ethernet port, analog headphone and mic-in jacks, a 0.3 megapixel (MP) camera, a 4-in-1 card reader (MMC, SD, Memory Stick, and MS-PRO flash card), built-in stereo speakers, and a digital array mic. Its 36 W/hr; 2S2P (2450 mAh/cell) Polymer battery is slide-in replaceable (you can change the battery yourself without undoing 19 screws) and offers a claimed "up to five hours" of continuous use. 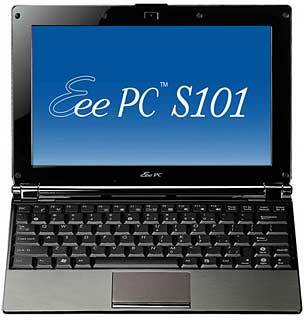 Of course, what the Eee PC S101 doesn't have is the Mac OS, being available with either Microsoft Genuine Windows XP Home or GNU Linux operating systems, the latter which comes with over 50 preinstalled applications. It gets along with a relatively poky (presumably 1.6 GHz, although Asus isn't telling) Intel Atom processor and and two-generations-ago Intel 945 Express (GMA 950) graphics, as opposed to the MacBook Air's full-fledged Core 2 Duo CPU and GMA X3100 graphics. To recap, the MacBook Air's several strong points are the Mac OS, a larger (13.3" 1280 x 800 resolution) display, a Core 2 Duo processor, and a full-sized keyboard, but Apple made too many compromises with connectivity, expandability, and practicality in their quest to make the MacBook Air fit comfortably inside a manila envelope, resulting in a machine that I wouldn't even consider owning (unless I became unexpectedly flush with disposable income and could afford one as an engaging toy), while the much-cheaper Asus (et al) netbooks are real computers that I could conceive of using for the same sort of production work that I do now with my old Pismo PowerBooks. If the S101 was (legally) supported by Mac OS X, the choice between the two machines would be a no-brainer for me, and I hear that Linux is getting better all the time. I think all of the S101's three available colors look great (make mine a brown one), and I prefer the look to the MacBook Air's , but I could do without the sequins. Apple needs a laptop like this running OS X. Will we get one tomorrow at an $800 price point? Not much longer to wait before we find out.